I’ve been living in Malaysia for three years but the only game I’ve been to see in that time was a friendly between a national select XI and Barcelona. It was thus long overdue when I took myself to the national stadium last week for Malaysia v Timor Leste, the opening game in qualifying for both the 2018 World Cup and the 2019 Asian Cup. I presume that the two tournaments are too close together to have separate qualifying rounds. 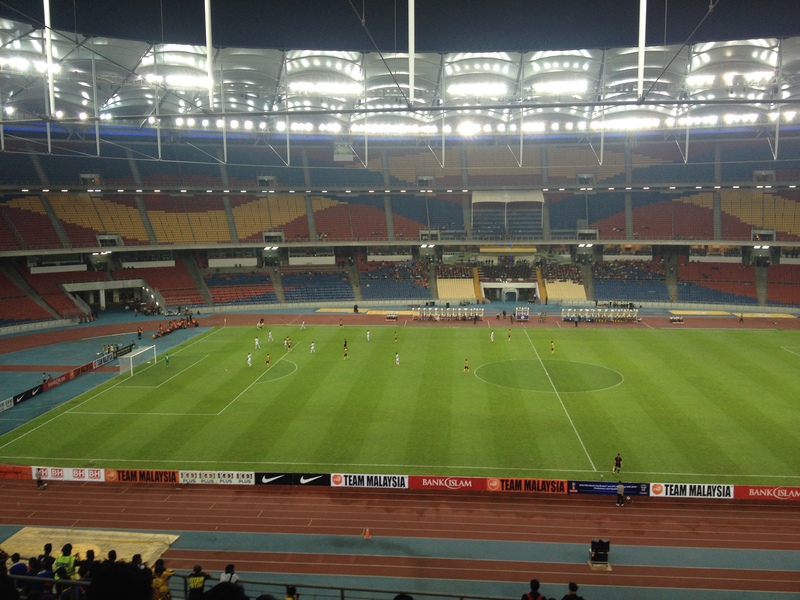 My ticket cost me a very reasonable thirty ringgit and I headed to the stadium early as I had to collect it there. After a few false starts and several well intentioned if somewhat inaccurate directions, I had my ticket in my hand. My search for the ticket counter had led me round quite a bit of the perimeter of the ground and I was able to enjoy the show provided by the Malaysian ‘ultras’ doing a pre-match tour of the outside of the stadium, singing and letting off flares. I also found several shops selling merchandise and treated myself to a scarf. For those of you who haven’t visited Malaysia, it has a tropical climate. It is hot, baking hot, all year round and pretty much all day and all night. Inside the ground, the giant screens informed me that the temperature was 29 degrees Celsius (accompanied, as always, by intense humidity). A scarf is perhaps not the best accessory for such conditions. I wonder if some alternatives could be considered in this part of the world – a branded fan for the fans maybe? I admit that the spectacle provided by the ultras might not look quite as good if they were waving fans rather than holding scarves aloft. The Bukit Jalil stadium is very impressive. It was built in the mid-1990s for Malaysia’s hosting of the Commonwealth Games in 1998 and its 90,000 capacity makes it one of the largest stadiums in the world. That capacity would not be required for this game however; I estimate that the crowd wasn’t much above 10,000. It was a free seating arrangement and so I was able to choose an excellent position among the many free seats. To my right, the ultras began to assume their position behind the goal. They had brought with them no less than ten drums and would go on to use them to wonderful effect, providing a rhythmical and passionate soundtrack to the entire game. The much maligned pitch looked in reasonable nick. The surface at the national stadium comes in for frequent criticism and the delicate superstars of Barcelona refused to play on it when they visited, prompting a late and rather farcical change of venue. The teams emerged on to the pitch behind a banner which read ‘My game is fair play – FIFA.’ I think FIFA may also want to reconsider some of its accessories. When the game got underway the first decent chance fell to Malaysia as one of our (I was going to say ‘their’ but hey, I have a scarf) strikers cut inside but dragged his shot meekly wide of the near post. After twenty minutes or so it was already clear that both teams were living up to their lowly rankings. Malaysia currently find themselves ranked a rather embarrassing 162nd in the FIFA rankings. For a country that loves football and invests a reasonable amount of resources in the game, its level of international football success might generously be described as modest. Timor Leste, to my surprise, are currently ranked 146th. Despite their higher ranking, Timor Leste were considered the underdogs in the match. The FIFA rankings get a little dodgy the nearer you get to the bottom. I don’t mean ‘dodgy’ in the usual FIFA sense of the term, merely that it gets harder to rank the weaker sides against each other, especially when they don’t necessarily play each other on a regular basis. Justifying their status as favourites, Malaysia were on top in the first half. We missed an incredible chance to take the lead on 25 minutes when one of our players was left all alone on the penalty spot as the ball dropped invitingly to him but he somehow contrived to blast the ball wildly over the bar. Timor Leste then spurned a glorious chance of their own as their centre forward burst clear of the static Malaysian defence to find himself facing a hesitating goalkeeper. It may have been an elaborate rouse on the part of our custodian though as confronted by such obvious panic, the Leste striker succumbed to it as well and attempted a dinked finish that rolled harmlessly wide. I hadn’t spotted any Timor Leste fans in the ground but following that miss the giant screens showed them (all six of them) celebrating the fact that a chance had been created by their side. The prospect of crowd trouble seemed slim. One Malaysian player was wearing tights which seemed just about as ridiculous as me being sat there in a scarf. In fact it was quite a lot more ridiculous since at least there were many others wearing scarves. Perhaps anything less than 30 degrees is considered a cold night in KL for some. Things warmed up considerably just after half an hour as Malaysia took the lead. Safee Sali slotted high into the net from a scrappy rebound after our man in tights had dug the ball out from a scrum of flailing arms and legs as the Leste defence’s attempts to clear turned into a game of Twister. It was a deserved lead and we all celebrated ecstatically but the wide empty spaces meant that the usual embracing of strangers that accompanies a goal was lacking on this occasion. Before half time, Timor Leste had a ‘goal’ correctly ruled out for offside. It highlighted a theme of the opening period whereby a single missed tackle in midfield invariably left either defence shockingly exposed. There was no half time entertainment. That is not a criticism but a compliment. I’ve written before about the needless and pointless attempts frequently made nowadays to ‘entertain’ fans during the half time interval. It’s only 15 minutes: time enough for a pee, a pie (or in this case a spicy burger) and a quick Facebook update regarding how poor your team has been in the first half. Reflecting on the first half it occurred to me that the ultras had produced a better prepared, more coordinated and more committed effort than their team. The teams re-emerged for the second half and I was reminded how much bigger and more physical the Timor Leste players were. Malaysians are not generally tall people or particularly physically imposing but the footballers appeared to me to be rather worryingly lightweight for the rigours of the modern game. The nation’s new technical director for badminton, Morten Frost from Denmark, has ordered all of the players to take fitness tests and improve their physical conditioning. I think the same approach might usefully be applied to the national football team. Safee Sali began the second half with some inspired and improvised juggling down by the corner flag as he held off several opposition defenders. The game then settled back into the rhythm that had been established in the first forty five minutes. It was a rhythm that reminded me of futsal (the fast-paced five-a-side version of the game played on a small pitch that is popular in this and many other parts of the world). It was obvious that most of the Malaysian players had grown up playing futsal and that it was their initial reference point for the game. One consequence of this was that they had a very limited understanding of how to best make use of space on the pitch. They frequently failed to spot teammates in lots of space or were unable to play the pass that would have opened space up. Much of their movement was towards the man on the ball, condensing space and making it easier for Timor Leste to put pressure on the player in possession. In some football cultures, such as the UK’s, the introduction of more futsal would be an unambiguously good thing as it emphasises technical ability and encourages players to be comfortable on the ball in tight spaces – things that aren’t developed naturally when you have eight year olds playing 11-a-side on full sized pitches. Futsal has long been credited with developing the skills that we associate with Brazilian players for example. In Malaysia however the overall standard is not yet good enough for futsal, by itself, to produce very technically proficient footballers and it also appears to have conditioned Malaysian players to play the game in a slightly unbalanced way. The rhythm of futsal is closer to basketball than to regular football and Malaysia left themselves very open as a result of their futsal-influenced style of play. Despite that we were still the better side by a considerable margin. More chances came and went, any one of which would almost certainly have made the game safe. 1-0 is always a dangerous lead though and just to emphasise that point a Timor Leste midfielder smacked a speculative effort off the bar with ten minutes remaining. It was a warning but Malaysia didn’t heed it. End to end the game continued in its basketball style. It was a good example of how two poor sides can produce an entertaining game. The clocked ticked past 90 minutes. Almost there. Then a silly free kick was conceded as Timor attacked down the right. The ball was swung in to the box and Saro got his head to it for the equaliser. He had been given as much space as those of us up in the stands. It was the ninety second minute. Dejection. As had been the case throughout the game, the Malaysian players got off lightly from the crowd. I don’t speak Bahasa but it was obvious that whatever insults were hurled they were pretty mild. The ultras drummed and sang on, completing a hugely impressive performance on their part. I looked across to the stand opposite and saw that the press gallery was almost as empty as the rest of the stadium. I’m pretty sure I could have got myself a press pass if I’d mentioned that I was going to do a write up of the game. There’s a book I’ve seen in several bookshops here titled ‘How Malaysia Never Reached the World Cup’ by a blogger going by the name of Lucius Maximus (I suspect that’s not their real name) with the tagline ‘a 40 year chronicle of failure.’ I very much doubt that Malaysia will make its World Cup debut in 2018 (the group includes harder opponents such as Saudi Arabia and UAE) but to have any chance at all we better win tomorrow night at home against Palestine. I’ll be there. Yes, I’m going back. Well, I have a scarf now.